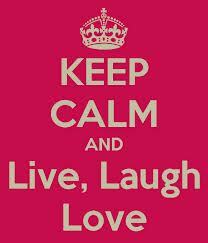 Live, Laugh, Love...they are three very powerful words and great ones I have come to strongly believe in. It is my favorite phrase. It is inscribed on a plaque and hangs in my bedroom in a place for me to see as soon as I rise each morning. I went through some very traumatic events over the past year and promised myself with this second chance, I will start living my life to the fullest. I will laugh more. And, through it all I will LOVE. After all, it's who I am. This has been a year of self-discovery; I finally feel I not only know who the true me is, but I am finally free to be me and I have surrounded myself with people who appreciate me. I am LIVING the life I longed for over the years. I have laughed so hard that it hurt down deep and brought tears to my eyes. And, I've made others laugh just as hard, too, which is rewarding in itself. As for love, I still have plenty in my heart and it will be put to good use!